Engage community partners in regional demonstrations. Register to receive information about sage activities via email. Searchable Project Database: Multiple project types and sources. Interactive Map: Projects with known locations. The Map tool is best viewed using Firefox or Internet Explorer. Google Chrome is not currently supporting the map tool. New! 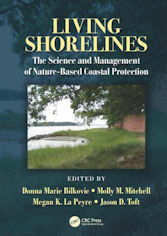 Living Shorelines: The Science and Management of Nature-Based Coastal Protection synthesizes and interprets the current state of the knowledge on the science and practice of nature-based shoreline protection. Coming March 2017. Order online and save 20%, Promo Code AQQ78. 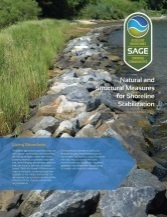 Numerous SAGE partners contributed to the content in this informative brochure that provides a helpful overview of the different types of shoreline solutions. This document is a great handout to help people learn about natural and nature-based shorelines.